Milan, Italy — Good morning from Italy, the most indebted country in Europe. It’s election day!All day and for half of the day tomorrow, Italian citizens will be going to the polls to elect a completely new government. The winner of the last election was Silvio Berlusconi, but he was basically forced out of office in late 2011, when Italian borrowing costs hit the roof. His replacement Mario Monti, successfully introduced reforms, and got borrowing costs down, but thanks to his tax hikes, became an incredibly unpopular person. Now Berlusconi is trying to make a comeback, a prospect that scares the hell out of markets and other leaders, given his antagonism towards the rest of the Europe, and the fact that Italy has so much debt. Any loss of credibility and a rise in borrowing costs could start the whole crisis again. Berlusconi is seeing running in a close 2nd place, and unlikely to actually surpass Pier Luigi Bersani, the centre-left front runner. But there’s a chance that Berlusconi could pull it off! Altogether, there are 3 scenarios that could shock the world. 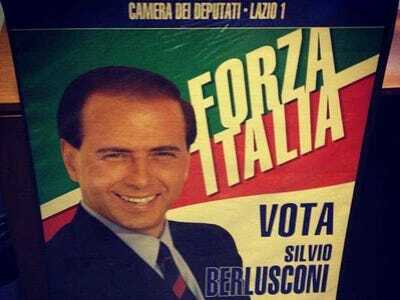 Berlusconi wins: Berlusconi is running probably between 3-5 points in the polls. That’s a pretty consistent deficit, so he’s clearly in 2nd place, but you never know how things could break on election day. We’ve seen insiders put his odds at winning at maybe just over 10%. If he won, Italy’s reform path would be shot, its relationship with its neighbours blown, and markets would tank. Beppe Grillo really surges: The candidate who is capturing the most attention and enthusiasm is blogger/comedian/populist/anti-banker Beppe Grillo. His new “5-Star” movement is a protest movement that’s appealing to the young and angry (thought not just the young and angry… we’ve also met professionals who like him due to his anti-corruption message). In the last two weeks, he’s seemingly gained daily in private polls, and he drew a crowd of 800,000 in Rome. He’s probably going to get at least 20% of the vote. But if his momentum continues through the weekend, and he draws more than 25%, then watch out. This will be a huge platform for a real protest candidate. Monti folds: The unpopular Mario Monti is in the race, but has no chance of winning. However, his support will be needed, most likely, to form a coalition government with Bersani. But if Monti’s party fails to get 8% of the vote, then they’re ineligible for government, and the coalition is shot. Watch to see if he totally folds. If any of the above happen, watch out. There will be a feeling of major Italian backsliding.